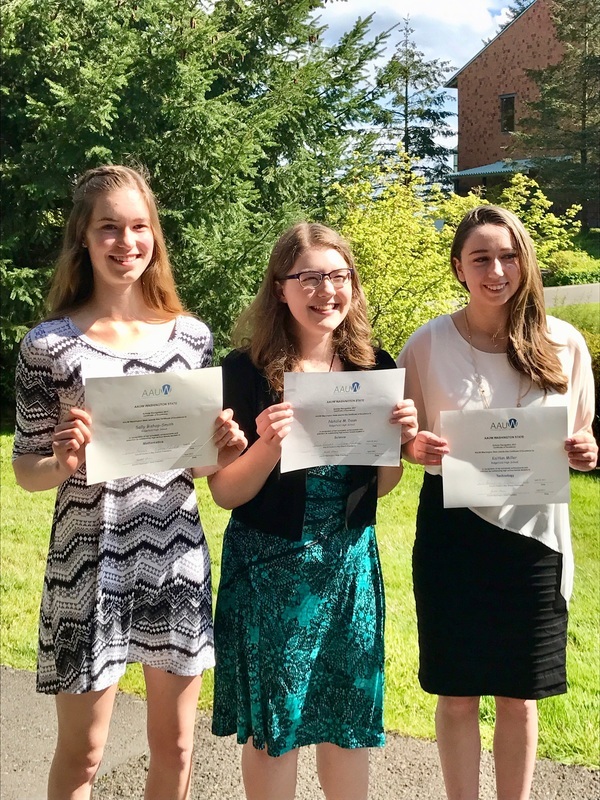 Three Ridgefield High School students were presented with Certificates of Excellence on April 29th by the local branch of the American Association of University Women (AAUW) for their achievements in the high school’s STEM (Science, Technology, Engineering, Mathematics) program. The awards were presented by AAUW Washington State at a recognition ceremony at Washington State University-Vancouver. RHS junior, Sally Bishop-Smith, won the award for Mathematics. Natalie Dean, also a junior, received the award for Science, and Kaitlan Miller, a sophomore, was recognized for her achievement in Technology. The young women were nominated by the Ridgefield High School faculty for their outstanding accomplishments in STEM. The American Association of University Women is a nationwide organization committed to encouraging women and girls to pursue success in the STEM fields.